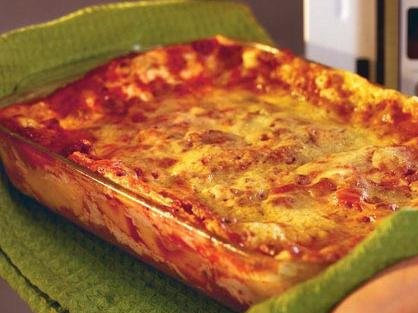 1 pound Italian sausage, casings removed, 1 jar Ethnic Cottage Jersey Fresh Marinara Tomato sauce, 1/2 teaspoon table salt, pinch of ground black pepper 6 no-cook lasagna noodles, 2 cups ricotta cheese, 2 cups shredded mozzarella cheese, 3/4 cup grated Parmesan cheese. Step 1 Crumble sausage into a plastic colander; place over a large microwave-safe bowl. Microwave at HIGH 1 minute, and stir. Microwave at HIGH 3 to 3 1/2 minutes more, stirring every 30 seconds, or until sausage is done and no longer pink. Drain well on paper towels. Discard drippings. Rinse and wipe bowl clean. Step 2 Stir together sausages, ethnic Cottage Jersey Fresh Marinara Tomato Sauce, salt and pepper in large bowl. Step 3 Spread one-third sausage mixture in bottom of a lightly greased 11- x 7-inch microwave-safe baking dish; top with 3 noodles, 1 cup ricotta cheese, and 1 cup mozzarella cheese. Repeat layers once. Step 4 Top evenly with remaining sausage mixture and grated Parmesan cheese. Cover with double-thickness plastic wrap, and microwave at MEDIUM (50% power) 30 to 35 minutes. Using an oven mitt, carefully lift one corner of plastic wrap to allow steam to escape, and let stand in microwave 5 minutes before serving.